Until 1980, this was the only known photograph showing virtually the whole of the south side of Krematorium IV. Experimenting with photographic papers of different sensitivities and different exposure times scarcely improve the poor quality of the original at all, mainly due to the fact that the original was simply a contact print. Just to the left of the building is the. temporary watchtower located at the turn in the Ringstrasse. The building itself is very nearly fnished, which means that the photo can be dated as being taken in mid-March 1943. The windows have only just been installed, as those of the furnace room still have on them the criss-crosses of paper that protected them during transport. From right to left on the south side we can see: part of the extended wing of the coke store: the double door and three windows of the furnace room containing the eight muffle furnace; the large central room lit by four small, high windows; the two windows of the doctor's room; the window of the coal store: lastly in the western part, with a lower roof, a door and three small, high windows in accordance with Bauleitung Drawing 2036. The chimneys of the stoves in these westernmost rooms can just about be distinguished. Between the two big chimneys, which have not yet been used (no soot stains at the top) it is possible to see a geodesic reference tower which is still there today. The fact that the south side of the western part of the building exactly matches Drawing 2036 led people to believe than the northern side of the building also matched 2036(p), but this was mistaken. The western parts of Krematorien IV and V photographed from the Zentral Sauna. then under constmcthon. 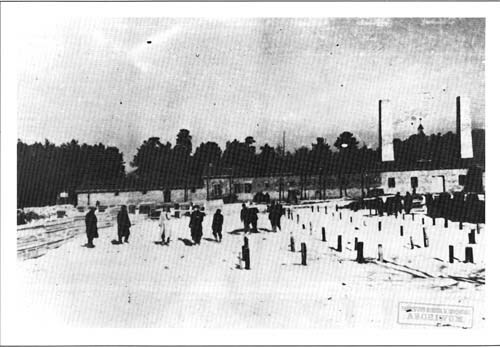 The photo was taken at the beginning of Aril 1943, between 1st and 7th, by SS Sergeant Kaman, who was photographing the excavations for the foundations of the the Zentral Sauna, looking north. He later took another photo from the same spot when the excavations were completed, but this time his camera was tilted at a greater angle and the two Krematorien did not appear in the picture, only part of the grounds of Kr IV, enclosed by barbed wire. 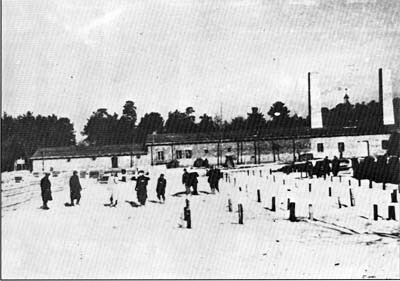 This barbed wire fence was being erected at the begining of April, as mentioned in a letter from Huta to the Bauleitung, dated 7th April (BW 30/30, page 5). The visible parts of Krematorien IV and V are labelled on the second photo. This photo shows that the western end and southern side of Krematorium IV was in accordance with Drawing 2036(p), and proves that the gas-tight shutters ordered by the Bauleitung from the DAW workshops on 13th Febuary 1943 had indeed been fitted on 28th as noted by the Riedel & Son site foreman. The photo also confirms that the stoves were installed in the two westernmost rooms, for their chimneys are clearly visible. Finally, although the picture is somewhat blurred, it is possible to distinguish a door in the south side of Krematorium V (to the left of the coal store window), giving on to the corridor and not shown on drawing 2036. Without this new door absolutely essential for proper ventilation, operation of the gas chamber of Krematorien IV and V would have been hampered by lack of adequate ventilation and the attendant risk of contamination of the rest of the building.